If you are anything like my mom, when I tell you that Luke escaped from the house yesterday while Andrew and I were at work, you won't want to hear the whole story. You probably just want to know--did you find him? Yes. I cannot believe this happened. He must have had to go to the bathroom pretty badly--as I couldn't get him to go that morning before I left for work. So, being the gentleman that he is, he took himself outside--thanks to the tricky lock at the back door that was deceptively in the lock position--but actually quite easily pushed open. Andrew and I came up the stairs from the garage, expecting him to be at the top of the steps, excited to see us. Instead, we found an empty house and an open back door. We both reacted by immediately going outside to find him. We split up and I started on our normal walk route, calling his name. Some curious neighbors peeked their heads out doors and I asked if they saw him. They hadn't. I made my way to a cul-de-sac where we normally do not go on walks. Because I had just met a neighbor on that street, I decided to go knock on her door to let her know to keep her eyes out for him. Before I made it to her front door--I saw a dog in a yard a few houses down. My eyes have played tricks on me before when I'm upset--so I didn't immediately let myself believe the dog I saw was Luke. As I got closer I could make out his brown and blue striped collar. It was him! I called after him, but the distress in my voice must have scared him. He walked in the opposite direction. I took a knee in my neighbor's driveway and kept calling him towards me--using my "Who's a good boy!?" voice. He came up to me and I grabbed his collar. I sat in the driveway waiting for Andrew to find us with Luke's leash--wrapping myself around him saying "Please don't ever leave again!" In the end, I take full blame for the incident. I should have been more careful with that lock. I knew it was tricky. Today, the door is REALLY locked and we put a big bin in front of it to discourage him from even thinking about it. We're adding a second lock to the door ASAP. Greyhounds can reach their maximum speed of 45 mph in three strides. Had he seen a squirrel or other critter to chase, he could have been in the next county within his first hour out of the house. We aren't sure how long he was roaming the streets--but the only neighbor who told us he spotted him loose said it was around 5 p.m.--thirty minutes before we discovered him missing. I don't talk about my religion much on this blog, but if you ask me, it was a small miracle that I found Luke. Many greyhounds who get loose are often killed when they run into traffic. I'm so incredibly thankful to have him back. Luke, I'm so sorry for not being more careful. Please don't leave us ever again. Oh Luke! I can't imagine how terrifying that must have been! Aw, I've had this happen before with a Husky/Shepard cross my family adopted a number of years ago. It can take them a while to settle into new surroundings and when they're alone it's not uncommon for them to check out the exits. My little guys have broken out of the house once, and it's one of those experiences that will definitely make sure you have everything all locked up tight from now on! oh how frightening. I am sooo glad he is back! that's so scary. i probably would have cried the second i saw the door was open. There have been a few times that Olivia has escaped and it was completely terrifying each time. Once she bolted out the driveway and straight down the middle of my very dangerous road. She was a good tenth of a mile away before she stopped, looked around and realized I wasn't around, and bolted back up the road. I was sure someone was going to hit her. Oh honey, I'm so glad you found him. I've never experience this with my Bailey but my ex's dogs used to get out all the time and I seemed to be in a constant state of hysterics trying to find them. Don't kick yourself for it, it can happen to anyone. scary! what a smart doggie though! so glad everything turned out! scooby used to bolt out of the front door when we first got him. he doesn't do it anymore though (thank goodness). Scary encounter. I'm glad Luke is all back safe and sound with you. I am SO HAPPY that you found him and he's okay. Big hugs, lady! I know we've already talked about this on gchat but can I just say how much I've gone through that and came out just as lucky? OMG Amanda, you scared the crap outta me! I really thought you were gonna say that he got run over. I got so worried when I first saw this post! But you found him, he's safe with you again and now that is all that matters. Don't be too hard on yourself, just be thankful that you have him home again. I've lost my dog before and he was missing for 2 weeks before we finally found him. I am so happy that Luke was close by and that nothing had happened to him. You poor thing - I can't imagine what it was like to come home and find the house empty! So glad he's back home safe! aw that's so scary. i'm so glad you guys were able to find him! Ohhh my gosh I feel your pain!!! Our husky got out a few times RIGHT when we got her and as soon as I knew she'd escaped I was devastated!!! I knew that her breed runs fast, and runs to run. I hope you never have to go through that again! so glad you found him! 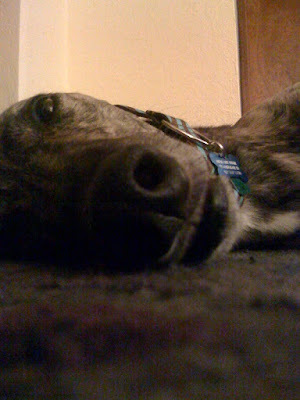 we have a greyhound too and he is such a love bug, although we raised him from a puppy and he never raced. So glad you found him! that's surely a scary thing. It's so terrifying when you don't know where your dog is. I can't imagine parents whose children go missing. It's completely unfathomable to me. We pick up our puppy in two weeks and this is one of my biggest fears. I just hope that if he ever does go off exploring on his own that we'll be able to find him. A while ago Rusty got out of our yard, when I realised it I swear my legs went numb. I ran outside, already thinking of which way I was going to go search first and there he was, pretty as you please, sitting on the sidewalk. I was terrified. The things that go through your head when something like that happens are just so scary. So glad you found him! Ohmygosh that's SO scary! I'm SOOOO glad you found Luke! I can't believe he was able to unlock the door! So crazy! So happy he's safe at home, where he belongs!